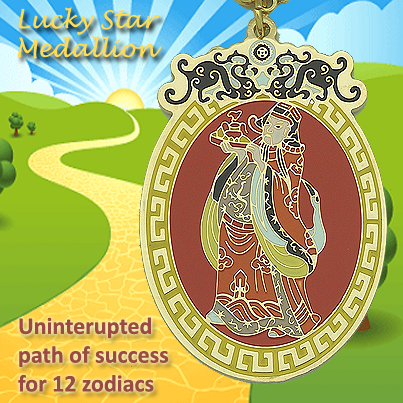 The Lucky Star Medallion promises a path uninterupted by setbacks or obstacles for all 12 zodiacs. "Zi Wei Star" whom originated as a lucky star is actually known as the "God of Immunity" or "God of Luck" who brings immunity against bad luck. Referred to as the "star god of time", he is the one who determines, controls and assigns where all the auspicious and inauspicious stars enter into the constellations of the 12 zodiacs every year. He is the "Heavenly Official" who grants good fortune and provides immunity for zodiacs who are pre-destined to suffer problems due to the visiting of negative stars. Zi Wei is famed for elevating one's success potential. He pacifies all negativities, removes all stumbling blocks along your way and helps you cope with difficulties you may encounter in everyday life. When you are programmed with success luck by Zi Wei, an ambience of positivity will be attracted to you at all times. This is an ideal feng shui enhancer for those who are facing challenging times in career, finance, relationship and health. It will overcome all the bad stars lurking in your constellation. It will also transform and overturn the luck of those who are suffering from acute and chronic bad luck. 1. The "12 Zodiacs Wheel of Fortune" enhanced with a "tortoise shell" in the center neutralizes any inauspice pre-destined to any of the 12 zodiacs. 2. 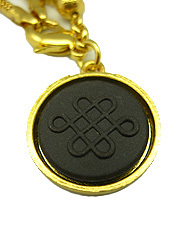 The taoist Incantation of "overturning bad luck to good luck" is the key in empowering this amulet by providing a special channel to the cosmic realm to invoke divine help in overcoming all misfortunes and pave way for positive outcomes in your career, love, health and relationship. 3. The other taoist incantation of "all wishes fulfilled" will materialize your wishes and grant you with success. 4. The Pi Yao will usher good luck and fortune, elevate wealth and riches, protect individuals, drive away evil, obstacles and hardship and bring windfall luck. 5. The Victory Banner is a powerful symbol of triumph. It signifies triumph over evil, disagreements, disharmonies, obstacles and anger. It is also a strong symbol of wealth recovery, suitable for those who had gone through bad and trying times before. It is a strong remedy to remove all types of sufferings. 6. The Victory Horse and Elephant will allow you to gain power, obtain good fortune and ensure no serious obstacles blocking your success. They possess endurance, strength, swiftness and obedience with connotations of success in attaining whatever goals one has set by strengthening inner confidence levels. This amulet wards off all types of bad luck, dangers and misfortunes caused by bad stars lurking in your constellation every year. One can carry along this amulet at all times, hang at the knob of the bedroom door, keep it under the pillow or beside the bed, or display the amulet in your personal zodiac direction. Zi Wei is the most important star in the chinese constellation system. This is because all heavenly officers reside in the "Zi Wei Palace". In a legend, Emperor Yu asked Zi Wei to capture the water god and lessen the damage created by floods. He conquered the water god in Huai River and used an iron lock to bind the water god at the foot of Turtle Mountain, thus totally in control of the flood. This was one famous part of his story. The Zi Wei shines above in the night sky and provides blessings of good fortune and good luck when visiting ones zodiac constellation. He is the only star god who is powerful enough to provide immunity for those who are pre-destined to suffer problems associated to evil stars! Every year will be a good year if you get his immunity. 1. At the entrance of your home, inside the vicinity of your doorstep. 4. At your work desk to enhance your personal career and increase your income stream.